The Osage City Chamber of Commerce strives to organize, host, sponsor or donate to several events throughout the year in an effort to help the local economy and townspeople. Chamber members can be pleased with the Chamber’s contributions and sponsorships of many events. These include donations to the Osage City Warmth Fund, ECAT, and ECKAN; and two scholarships presented to a male and female senior each year. 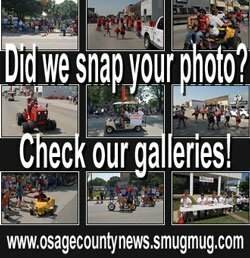 The Osage City Chamber of Commerce is a supporter of the well-attended Osage County Fair fireworks display and a sponsor of the nationally-known Smoke in the Spring BBQ event. Anyone advertising on the citywide garage sale map generates funding to the two chamber scholarships awarded in May of each year. Mariel Robert was the 2014 recipient. There were no male applicants this year, and Chamber encourages future Osage City High School male seniors to submit an application accompanied by an essay. Anyone purchasing raffle tickets during Christmas on Market generates dollars to be shared with ECAT, the Warmth Fund and ECKAN. Every membership is used to build the Chamber’s operating budget. The budget is developed yearly and the budget committee plans ahead. 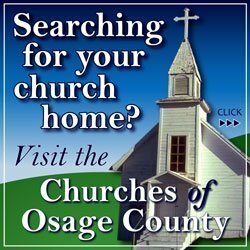 In addition to advertising in the local paper, the Chamber advertises in the BBQ competition booklet, and the Osage County tourism guide (each chamber member is listed in the Chamber’s large display in the guide). In addition, radio announcements are used during large events. Chamber members are urged to notify the Chamber of their business’ events so we can share with other members and post on our Facebook page. I welcome tidbits of information to help me stay apprised of new businesses, business changes, events, recognitions, achievements and announcements. A 2014 chairperson and committee and theme for the Christmas opener and Christmas on Market. Osage City’s GOT IT! Need information from members who haven’t been featured. Don’t be shy! Ambassadors to help build our membership. Call Cathryn 785-528-4711 or email [email protected]. Janet Steinle reports the Ecumenical Community Action Team style show fundraiser held in early May was a smashing success! Approximately 120 attended and enjoyed a delightful evening of entertainment right here in Osage City. Over 35 school children and several adults modeled all sizes and types of clothing. A 1930s swimsuit was a hit. A deliciously decadent chocolate bar added an elegant touch to the evening. One purpose of the event was to enlighten the community as to what ECAT offers; highlighting the nice clothing that is available to everyone who comes in. The event raised over $1,350. The school children immediately started asking coordinator, Letisha DeBaun, if they could model next year! ECAT is pleased to be a Chamber member. 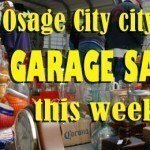 For more information about the Osage City Chamber of Commerce, contact executive director Cathryn Houghton at 785-528-4711 or [email protected], or visit www.osagecitychamber.com.